It is not a coincidence that fall foliage is the same color as the sunset. I learned something about the changing leaves during my recent trip to New England. Autumn leaves are simply breath-taking. We describe them ubiquitously as “vibrant.” Merriam-Webster’s first definition of “vibrant” is “pulsating with life.” Despite that perception of vitality, the changing leaves are more about death than life. The process by which leaves change colors is not as much about creating something as it is about destroying something. Time’s weathering strips the tree of the chlorophyll that allows the life-giving green color to flow into the leaves. It is scarring that robs these trees of green… of life. The colors we see during the autumn are the “real” colors of the trees. The fall leaves are the essence of the tree, all that is left visible and beautiful in the aging process. Before my mother’s illness and death, I never used to think much about my own mortality, nor, by extension, my own aging. I never felt terms like “old” or “elderly’ or “senior citizen” applied to me. Even when I retired, which is probably our cultural definition of “aging,” I never felt myself to be “aged.” I saw my retirement as simply compensation for fulfilling a contract. I knew that there was an age qualifier on that contract. I simply chose to concentrate on the fulfillment of 30+ years of hard work that I promised to complete for the government as opposed to the number of years in my age. After my mother died, I think that changed. Suddenly, the idea that I will die within the foreseeable future came sharply into focus for me. I began to lose interest in dreams because it seemed like nothing really mattered- I was going to die anyway. My gut turned over and threatened to escape whenever I contemplated life events and opportunities that I will likely never get to experience or experience again. I will never be a parent. I will never get to live in an environment, like New England, completely different from anything I have ever known. I will likely never see some of the places I have visualized going. When I start thinking about major purchases, like cars and computers, and vacation trips, it disturbs me greatly that I can see the “lasts” in my future. I am getting nauseous just writing this. It feels really terrifying. I am only 59. I am sure some of you are wondering what right I have to be so morbid at such a comparatively young age. I don’t know, but my mother’s death seems to have been the catalyst that reminded me that my life, like every other life, is limited. I still feel some futility and impossibility when I look at the future. I am pretty happy with the priorities I have set in my life. I’ve had wonderful experiences and beautiful relationships. I always have joy somewhere in my heart. The problem now is learning to accept that I won’t have everything and to believe once more that whatever life I have left is valuable and meaningful and rampant with possibilities…. even though that life is going to come to an end. Just as the trees are losing their green, I am losing my youth in this autumn of my life. Still, autumn is pretty wonderful. The mosaic of reds and oranges and golds and browns is certainly more interesting and more eye-catching than the landscape of green. My own landscape is more colorful, more interesting, and warmer than it was in my youth. I don’t have to concentrate on the fact that my snapshot of the world is fading. I can concentrate on the beauty that snapshot captures. My activities and dreams are not moot because the chlorophyll is dimming. They are still precious and wonderful because they are made up of the stripped-down, primal essence of the beauty that is me. I’m trying hard to avoid dismissing the joy of my life because the day will come when that joy will cease to exist. First of all, I may not know what joy will look like in God’s kingdom, but I know it will be there. Secondly, I think we were meant to experience our lives fully, not ration some happiness “for later.” Thirdly, gifts are gifts, no matter when they arrive in our lives. An awareness that those gifts are finite can increase our appreciation and enjoyment of them. Also, the timing of those gifts can make them even more precious to us. After all, we do not mourn the loss of the green when we gain the beauty of the fall foliage. Yes, the colors of the autumn foliage are the same colors as the sunset. They do represent a loss. However, they are also brilliant and joyful and lovely. They beckon me to immerse myself in life and create joy. Fall is a time when I can experience some things I can experience in no other time of the year… or of my life. You know, the colors of the autumn foliage are the same colors as the sunrise, too. And that is not a coincidence either. How do you think about death? Have you experienced any losses that have also helped you gain a richer perspective about life? Are you living a sunset or a sunrise? Please share your perspective by leaving a comment. In the alternative, you can email me at terriretirement@gmail.com. I say I’m not very good at once-in-a-lifetime experiences. I justify spending money to do something by saying, “I’m only going to do it once,” but I am rarely successful in limiting myself to one time if I enjoy an experience. Even though my dolphin day at Discovery Cove was beyond my wildest expectations, my initial thought was that I probably wouldn’t do it again. There is a steep discount on the admission for Florida residents. Still, I did suffer a bit of sticker shock when the ticket price showed up on my credit card. The amount just seemed ridiculous for a day at a theme park. On the other hand, the admission gets you a lot for your money and there is a pretty low limited daily entrance to the park. You never feel like you are fighting the marauding hordes for your entertainment or for any of the “free” (well…. let’s say “included in the price of admission”) goodies they hand out with wild abandon (meals, snacks of every ilk, soft drinks, frozen beverages, beer, wine, dolphin safe sunscreen, towels, snorkeling gear, showers, shampoo, conditioner, and other stuff that I’m probably forgetting). Also, the admission price includes unlimited admission for fourteen days to Sea World and the other sister park, Aquatica. You can probably tell that I am still trying to justify my decision to pay the big bucks and return to the park this year. Since I went ahead and did it, it is probably time to let it go. Once I made my reservation, I began to wonder if my second trip to Discovery Cove would be as magical as my previous visit. Was it possible to enjoy the experience as much once the serendipity factor no longer applied? I remember that, on my first trip, it seemed like some unexpected, delightful surprise lurked around every corner. Now that I knew the drill, would these encounters fail to enchant me? Also, last time, my Discovery Cove trip came at a particularly difficult and stressful time in my life. In fact, I’d cancelled my original reservation because it was scheduled when my mother’s stroke was still a new and stultifying situation. By the time I actually went, my mother and I had already been through most of our difficult journey together. She had been living in the skilled nursing facility for about five months. We were past the point of believing she was going to improve and not yet at the point where death prepared to pounce. We were both living in a shadow world and trying to light the way for each other. I’m sure the fact that my first trip to Discovery Cove propelled me totally away from Stroke World for one, beautiful, restful day enhanced my first experience. When I packed up for my recent excursion, I was a little apprehensive. Maybe it was better to live with my perfect memory of my “once in a lifetime” Discovery Cove adventure rather than risk overlaying it with another trip that might not be as wonderful. Then, I considered that I am trying to broaden my horizons by being braver and less anxious. I am trying to embrace the now rather than living in the past or obsessing about the future. I am trying to stop automatically saying “no” to things simply because they make me a little uneasy. So I said “yes” to myself and went to Discovery Cove. The activities I enjoyed at Discovery Cove were very similar to my prior visit. I swam with the dolphins, snorkeled in the salt water reef, waded past marmosets and otters, fed birds in the aviary, and lounged my way down a lazy river. I spent hours and hours in the water. I ambled aimlessly around the beautiful grounds, sliding my feet through the elegant sand beaches and splashing around the edges of the coves. I ate and drank and read my kindle. I shopped in the little stores. I stayed even longer than I stayed last year. And I enjoyed every moment of it. That spontaneous reaction started me thinking. Was it the best day ever? How could it be better than my last trip? Was it better than my last trip? Wasn’t it the same experience? In purely objective terms, I could argue that this visit might not have been quite as good as my first visit. The dolphin assigned to my pod was a bit of a maverick and wasn’t really in the mood to play host to a bunch of strangers that day. Her dolphin ADHD required some patience and creativity. It was a bit chaotic. Also, the sloth I went to visit at the animal encounter kiosk was not able to overcome his slothful DNA and rouse himself from his crate, so there was no small furry animal petting on this visit. Also, I forgot my credit card and worried that I would be unable to purchase merchandise to take home. I also lost my brand new sparkly prescription sunglasses somewhere in the depths of the snorkeling reef. Still, I had a wonderful time and I am not even going to pretend that I don’t want to go back next year. So, what was different this time that made my visit a new, magical event despite the minor glitches I’ve mentioned? It is true that the activities were basically the same as last year, but the difference is that I am not the same as last year. I am much further along in my journey to improve my capacity to enjoy life as it comes and embrace new adventures without mourning what they are not. I am more confident. My heart is more open. My brain is calmer. I even embraced the glitches. I didn’t just tolerate them; I leveraged them. I may not have been able to pet a sloth this time around, but I had a new experience. I held a macaw on my arm. That was pretty cool. Instead of worrying about the scheduling short circuiting while my dolphin played keep away, I enjoyed the extra time in the cool saltwater surrounded by a whole navy of dolphins. When I realized that I had forgotten my credit card, I stopped to strategize about how I could overcome the problem. In the past, I know I would have panicked, mournfully declaring immediate defeat. I would have been all woebegone over my inability to buy stuff. This time, I remained calm and brainstormed some ways I might still be able to charge merchandise. In doing so, I figured out how to use Apple Pay. While the loss of my sunglasses was a little more difficult to push away from my overactive nervous system, I was able to do so. I remembered that these glasses were the same prescription as my old ones, which were in the glove compartment of my car. I didn’t love that I lost the glasses, but it was not a tragedy. As if to reward my determined Zen-ness, someone found my sunglasses and returned them to Lost and Found by the end of the day. So even though my day’s activities were pretty much the same during both my visits, each visit was a very different experience. Both were the “best day ever” while I was living them. Maybe this most recent visit felt even more like the “best day ever” because I have changed enough to immerse myself more deeply in the present moment. Nothing is ever exactly the same. The earth keeps turning and the soul keeps growing. I think every experience is a once-in-a-lifetime experience. What do you think? Have you ever done something that seemed very different than a time when you did it before because you were different? Please tell us about it! Please share your perspective by leaving a comment. In the alternative, you can email me at terriretirement@gmail.com. Some people attended the royal wedding last Saturday. 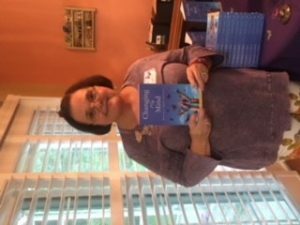 Other people attended my book launch party for Changing My Mind: Reinventing Myself In Retirement. Maybe I’m biased, but I think we had a better time at my event. I certainly did. Giving a party is not something that comes easily to me. In fact, I’m not sure I’ve ever given one before now. My natural shyness has always made it challenging for me to attend a party, much less give one. The idea of being responsible for entertaining people actually made me a little nauseous in the weeks before the party, if you want to know the truth. Publishing the book is one of the most exciting things to ever happen to me. I am very proud of my pretty little book. If ever I was going to host a party to celebrate an achievement, this would probably be the time. Still, deciding to actually do something about it was unreasonably terrifying. I vacillated about having a party for weeks. In the end, it was my resolve to be more open to new experiences that motivated me to entertain the idea of a launch party. It was the help and support of my friends that actually made it happen. Left to my own devices, I am positive I would have talked myself out of it. Two of my friends immediately jumped on the bandwagon when I broached the possibility of a launch party. Not only were they wildly excited about the idea, they immediately offered all kinds of help. Their contributions were way more than I dreamed of requesting. I was just hoping it wouldn’t be too much of an imposition to ask them to be my social safety net. One of my friends, in particular, is wonderful at making people feel comfortable. I can’t explain how she does it because it is a completely foreign skill to me. I only know that she is warm and welcoming and accepting. People just feel good around her. I asked her to be on the lookout for awkwardness or tension and just “fix it” during the party. Not only did I get my safety net, my friends contributed most of the food and wine for the party. They helped me plan. They asked me good questions about what I wanted so that we could brainstorm ways to address aspects of the party I might not have considered on my own. They loaned me extra chairs, an ice chest, and other entertainment accoutrements. One friend created a beautiful art piece from a photo of my book cover. 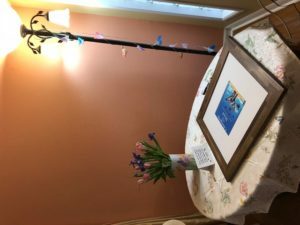 She had it matted so that guests at the party could contribute their own messages around the picture. Maybe most importantly, my friends kept the momentum of excitement flowing as we approached the countdown to Party Day. That momentum of excitement washed away any vestiges of dread my panic dredged up. Other friends also fueled the Party Train. Something else I am not good at is self-promotion. Inviting people to the launch party felt a little like pressuring your friends to attend your Tupperware party…. and you are the one who invented Tupperware. I felt like I was putting people in an impossibly awkward position by asking them to come to the launch party or even suggesting they might want to buy the book. It was kind of excruciating. I tried to overcome my antipathy, in the spirit of embracing new experiences. I tried to allow myself to accept that I wasn’t imposing on the kindness of strangers and that people actually wanted to celebrate my book. My friends certainly gave every indication that this was the case. I’m still somewhat befuddled by the reaction. I mean, I am excited beyond all reason about the book, but that doesn’t mean everyone else should be. 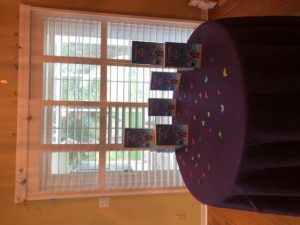 Just experiencing my friends’ pleasure about my book helped me commit to turning my house into Party Central. Everything ended up being wonderful at the party. I’d put the food, drink, and companionship of my party up against the royal wedding any day of the week! We had a room of folks on site at my house. Some long-time, deep-hearted friends of mine from California came to Florida for the party. Friends from our community and friends from my church blended. My brother and his wife, my cousin-brother and his family, and a work life friend joined by conference call. We had an icebreaker that helped everyone get to know a little bit about each other. We joked and laughed and appreciated each other. I read from the book and took questions from the crowd. My family and friends said wonderful, generous, kind things. We had drawings for fabulous prizes. During the toast, I thanked the people who have made this experience, culminating in the party, possible. That is, I tried to thank them. 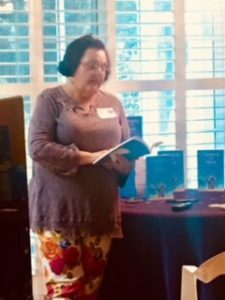 I am embarrassed to admit that, even though this whole event was to celebrate my accomplishment as a wordsmith, I could not find words beautiful enough to thank people for their love. It was the most joyous celebration I’ve ever attended- not just a celebration of my book, but a celebration of friendship. I think we had the royal wedding beat in that arena, as well. No offense to the new Duke and Duchess of Sussex and not to malign their guests or anything, but I am certain that I have the bestest friends! For those of you who did not attend, we missed you. Fear not, though. You can keep the party going. You can leave a comment to add your greetings to those of the party-heartiers. Also, you can order a copy of my book, Changing My Mind: Reinventing Myself In Retirement. You can get the book in paperback, kindle, or nook editions. If you go to my direct-to-reader sales page (https://secure.mybookorders.com/Orderpage/2076 ), you can order your copy. If you order a paperback copy, you can use the promo code terri to get a 15% discount. You can also order the book at Amazon, Barnes and Noble, and other online retail book outlets. The promo code applies only to orders on the direct-to-reader sales page, however. Thank you to all who attended my party. Please know that you helped create something wonderful. I feel spectacularly special and abundantly blessed. Do you want to join in the fun? Let’s keep the celebration going! Please leave a comment to add your message about the publication of Changing My Mind: Reinventing Myself In Retirement. I’d love to hear from all of you!